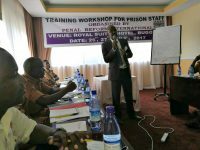 With support from the British High Commission in Uganda, last week PRI’s office in Sub-Saharan Africa conducted training for prison staff on the management of vulnerable prisoners, including the mentally ill, disabled prisoners and the elderly. 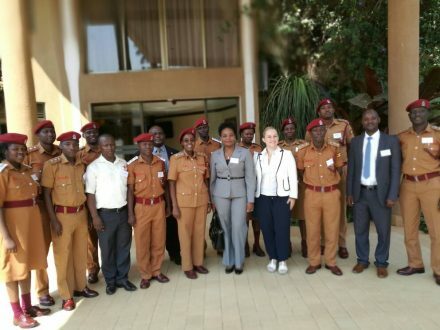 The two-day workshop, which was held in Kampala, provided training for 18 prison staff. The training included an overview of the Nelson Mandela Rules (the UN Standard Minimum Rules for the Treatment of Prisoners) and the Bangkok Rules (the UN Rules for the Treatment of Women Prisoners and Non-Custodial Sanctions for Women Offenders), with a focus on provisions related to the treatment of vulnerable prisoners. Some of the practical challenges raised by the participants were ignorance of the international standards (many had never heard of the Bangkok Rules); stigma among staff and prisoners regarding the rights of vulnerable groups; financial constraints; lack of technical capacity to manage vulnerable prisoners; and prison congestion. The participants made the following recommendations: that training for prison staff should incorporate the Mandela Rules and Bangkok Rules in the prison staff curriculum, including more copies of the Rules; advocacy should be enhanced to support mentally-ill prisoners; the training should be extended to other parts of the country, targeting both staff and inmates; and alternatives should be encouraged for vulnerable offenders, e.g. the elderly and disabled. Read PRI’s short guide to the Nelson Mandela Rules, or watch a two-minute animated introduction.